In a pan, bring the maple syrup and butter to a boil and cook for 2 minutes. Add the nuts. Continue cooking, stirring with a spoon until the sugar becomes granular on the nuts. Remove from heat. Pour on the baking sheet and spread evenly. Salt lightly. Let cool and crush coarsely. 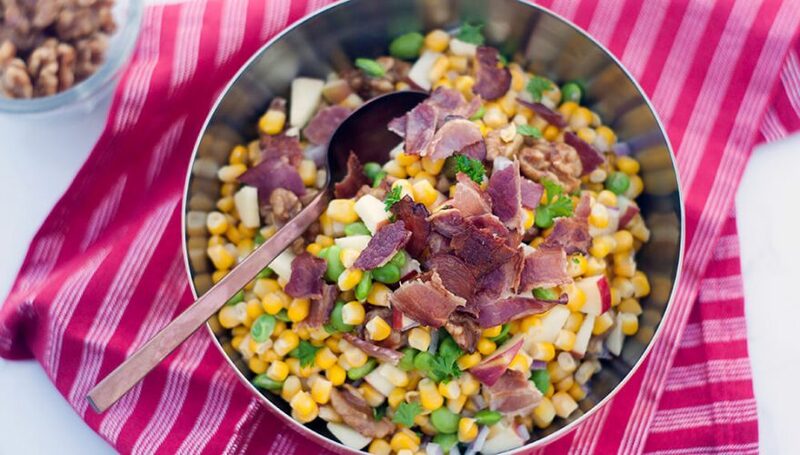 In another pan, cook bacon until almost cooked, add corn and onion and grill with bacon. Put the preparation in a large bowl with the edamame beans, the apple and the nuts. Mix all the ingredients of the salad dressing with a whisk and pour over the salad.